Spacious lounge with tradtional wooden rocking horse. 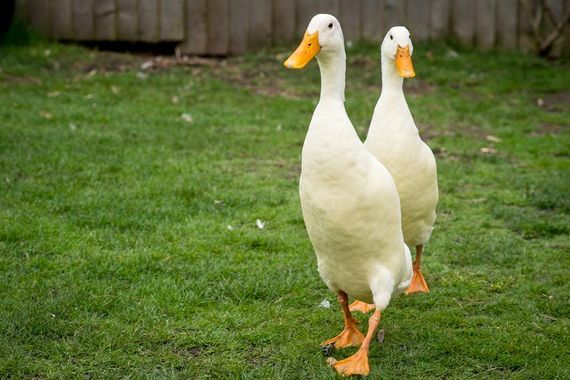 Dani and Daisie live next door and the owner is happy for little ones to help feed them. Luna the rabbit lives next door and owner is happy to arrange meet and stroke times for mini guests. If you're lucky enough to have babies who let you sleep past dawn, there can be few better ways to wake up than by leaving the shutters open and watching the sunrise over the Ibsely nature reserve through the huge cathedral windows of the master bedroom from the comfort of your super-king bed. Those with less accommodating children will be glad of the shutters and more appreciative of the sunset views! 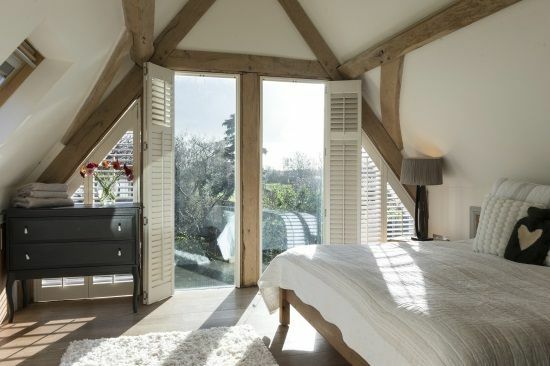 The windows, along with the vaulted ceilings, exposed oak beams and interior flooded with light, are a major part of the stunning architectural design of that earned this pretty two-bedroom cottage a slot on Channel 4s 'Grand Channel 4's Grand Designs and a request from presenter Kevin MCloud to move in permanently! As well as its impressive eco-credentials thanks to the solar panels linked to under floor heating, grey water recycling set up and eco-luxe bedding. Parents will appreciate the comprehensive list of baby and toddler gear, along with high quality fixtures and fittings, which include a large plasma TV, DVD/CD player, full SKY package, in-wall surround sound system, coffee machine, and handy blender, plus more standard microwave, dishwasher and washer/dryer. 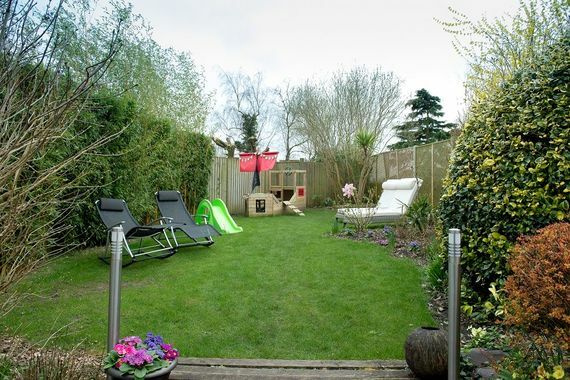 Little ones will make a beeline for the basket of toys and books in the lounge and enjoy the freedom to roam in the large, safely enclosed garden which is overlooked by a decked patio area with garden furniture and a BBQ. A generous organic welcome pack, and optional arrival night/first day massage service sets the tone for an indulgent break for the whole family. 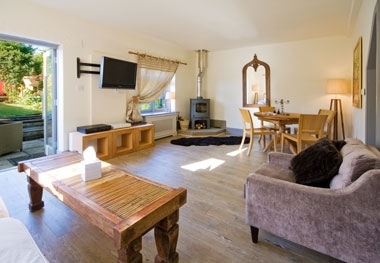 Dairy Cottage is a beautifully designed and furnished 2-bedroom retreat, nestled alongside the owner's thatched house. It has its own private, large garden and spectacular views from its master bedroom over the nature reserve behind. 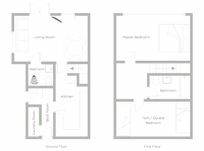 The house has 2-bedrooms, a full bathroom and a downstairs shower room. The kitchen is fully equipped with all mod cons and the spacious, open-plan living area comes with romantic log burner, large dining table and comfortable lounge area with flat screen TV, DVD and music system. Outisde, the enclosed garden boasts a dandpit and pirate ship for kids and luxurious loungers for adults. Please Note: Flexible arrival dates/stay lengths on request. Pricing is based on 2 adults & up to 2 children. A 10% supplement should be added for bookings including 3x adults and a 20% for those of 4 x adults. Despite its peaceful location, in the New Forest National Park, the cottage is very conveniently located just a few minutes drive from the Ringwood turn-off the A338 or A31.It's just 15miles from the coast at Bournemouth and the same distance to the historic catherdral city of Salisbury. 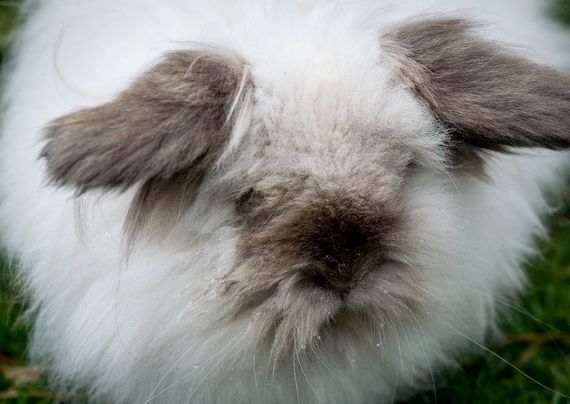 As a mum, Cheryl, has plenty of suggetions for fun things to do locally including: wildlife spotting, as well as picnics in the forest; Nearby Longdown Farm for its friendly farmyard animals, new indoor ball pool and BIRO wooden play equipment zone and Paultons Park for Peppa Pig World and it's range of toddler rides. 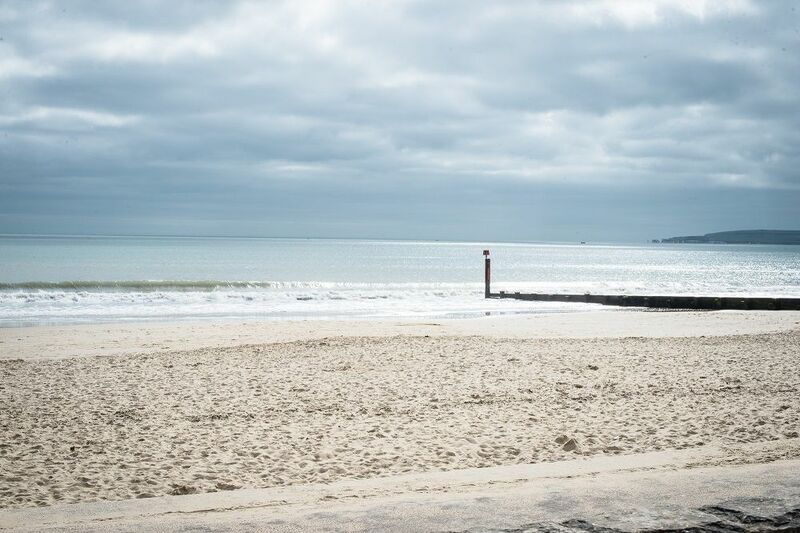 Of the many seaside towns within a 20 mile radius of the cottage, Owner Cheryl, highly recommends the beaches at Sandbanks and Mudeford Quay beaches, both within 25mins drive. Whist, Highcliffe is recommended for its picturesque castle leading to a scenic sandy beach; Hythe for the train ride along its Victorian pier; and yachting haven Lymington for its great selection of restaurants, boutiques and bistros, which includes the child-friendly Vanilla Bean Café – great for Sunday brunch and babychinos! For a special night out or classy lunch, The Pig or Limewood Hotel's are both family-friendly, cool and contemporary with great reputations for food and cocktails. Please Note: Pricing is based on 2 adults & up to 2 children. A 10% surcharge will be applied by the owner for bookings including 3x adults and a 20% surcharge for those of 4 x adults. Enjoy stay at Dairy Cottage before Feb. 2019 & save 15% + stays include a one hour thai massage at a local spa & a breakfast hamper including sourdough bread, local free range eggs & pastries. Sleeps 2+2+1-2cots in a large double bedroom and a chldren's twin room. There are 2 bathrooms. Southampton airport is just over 30 minutes drive away. Professional babysitting can be pre-booked on request. Equipment available on free loan includes: 2xzed beds, a selection of strollers (a Greco, a Quinny, double maclaren and a single maclaren ), bouncer chair,bibs, steriliser (with 2xbottles), bottle warmer, magi-mix, fly net cover for cot, feeding pillow, changing mat, 2xbaby baths (upright & regular), baby toiletries (wash, shampoo & oil), potty, bathroom step, Baby monitor and plastic crockery and cutlery. 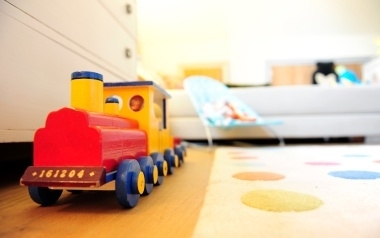 Good range of toys provided includes: Play Mat, rubber ducks, Iggle Piggle, Soft toys, books, wooden trains, rocking horse, walker, kids chair, kids DVDs & SKY TV with kids channels. Treatments from a visiting beauty/massage therapist or acupunturist can be arranged on request. Fixed stair gates top and bottom of stairgates. Stunning architectural oak frame, underfloor heating, eco woodburner, solar heating, water recycling unit and eco friendly cleaning products. The cottage has a log burner. We booked Dairy Cottage very last minute and were not disappointed. Beautifully finished inside and out. 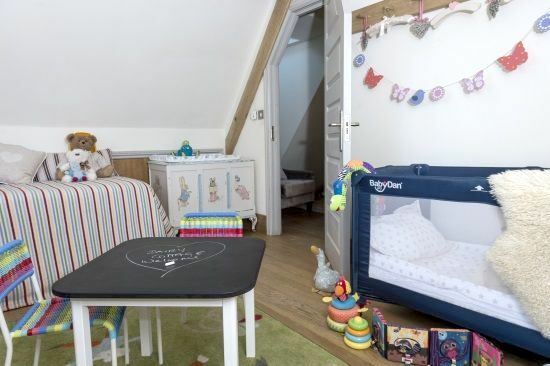 We loved the children's bedroom, it has been put together with huge amounts of care and attention to detail and the landing is a fabulous play area contained by a stair gate. There is even a little play kitchen in the cottage kitchen - Cheryl has thought of everything. We forgot bibs..there were bibs! 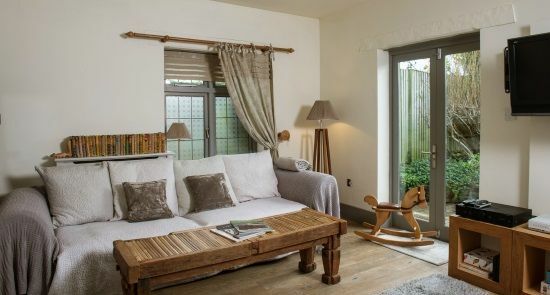 A truly baby-friendly bolt hole in a lovely setting. Enchanting, cosy, full of character and in a great location. Cheryl is excellent, generous and helpful which adds to the charm of the cottage. Top marks all round! Perfect for holidays with small children - everything has been thought of and our 21 month old had a fantastic time with all the toys and the lovely garden, and there is lots to do nearby. Highly recommended! Beautiful cottage with everything you could ever need. Highly recommend! Gorgeous cottage!! Had everything we needed for 1 year old twins. Location was great and host was fab and helped us with a few queries/requests we had during our stay. The breakfast hamper was a great touch too and was really appreciated. 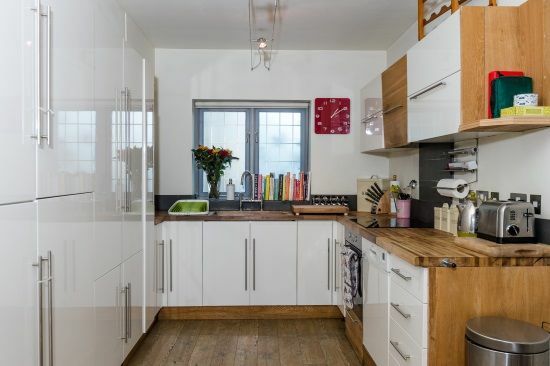 This property looks amazing on the website but in person it looks even better! We really didn't need to pack anything for our twins as the cottage had it all! The boys loved all the toys, pirate ship, paddling pool and baby kitchen. 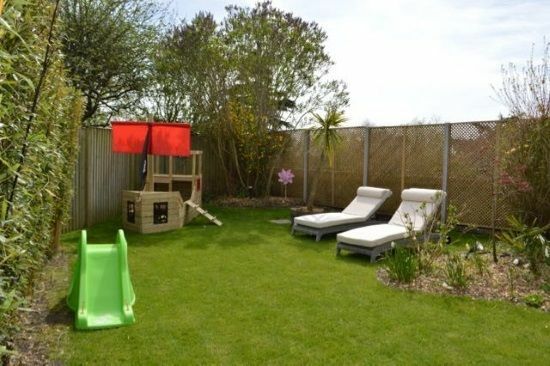 The cottage is set on a lovely lane with the beautiful new forest and beaches on the doorstep. A really lovely walk to the local cafe / farm shop. We had a wonderful food hamper on arrival was a real treat for us as well. We hope to return to this lovely place. We had a fabulous time at the dairy cottage with our 4yr old twins and 8mth old baby! It's a lovely place to spend time as a family! 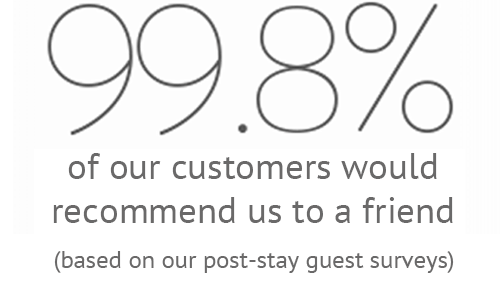 We really enjoyed our stay and Cheryl was fantastic and very accommodating! The beach hut is also an excellent addition to this property and if you get the chance definitely use it! Thank you! "A True Baby Friendly Bolthole" without doubt, the best baby friendly holiday location we have visited! 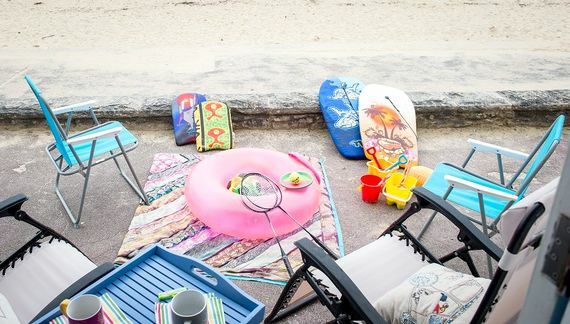 This place nails the perfect holiday for parents looking for luxury that still caters for the fussiest of toddlers! 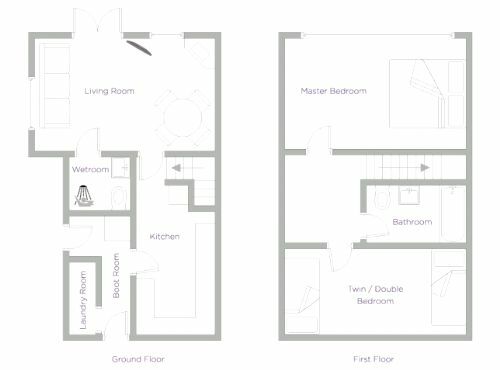 From the beautifully designed bedroom with "white company" linen on the super king bed and bathroom complete with toiletries, candles and abundance of bathroom toys, through to the very well equipped kitchen (along with a mini version for younger guests!) 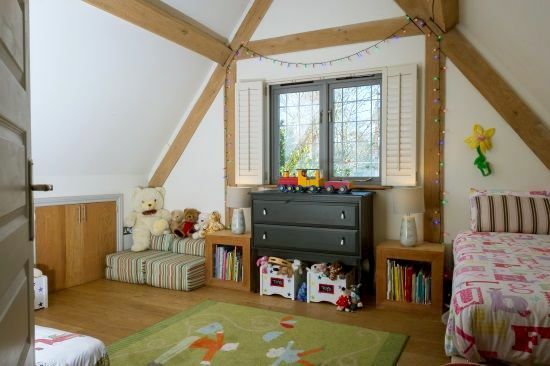 and a beautiful children's bedroom packed with beautiful toys and books. 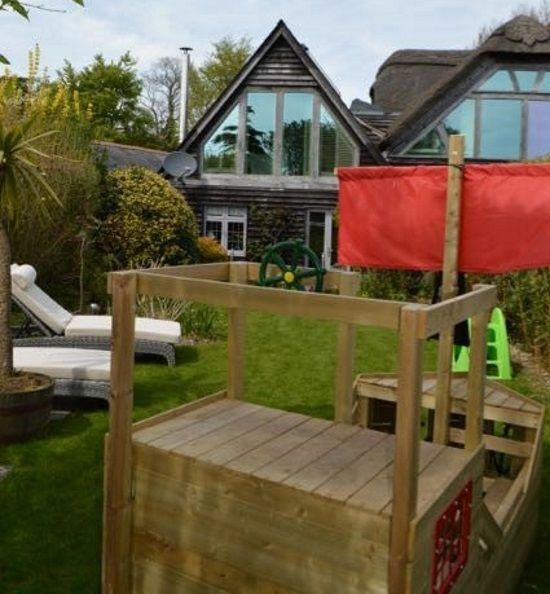 The garden is a delightful oasis with sun loungers, sandpit, slide and it's own pirate ship too! What tops this holiday off is the brilliant attention to detail of extras, the stocked larder that contains all those annoying things you loathe to buy on holiday such as oil, herbs, flour, sauces, tea and sugar - there's even a choice of coffee pods for the Tasimo! A generous welcome pack of local eggs, yoghurt, bread, bacon, fruit and milk was fabulous on our arrival topped off with Pom Bear crisps for our daughter and Prosecco for Mummy! Every possible baby plate, cup and bottle you could need is carefully stored in the kitchen with some great Le Creuset cookware and John Lewis Saucepans. The supply of all the extras such as bin bags, foil, dish washer tablets and laundry items is an absolute winner for busy parents that want to get on with their holiday rather than supermarket shopping. 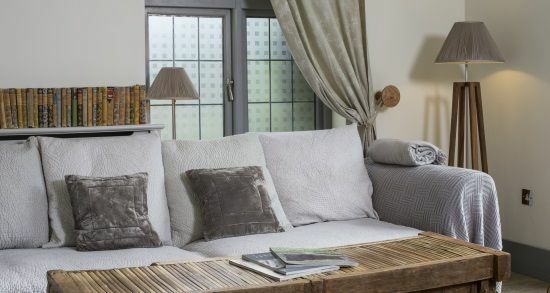 You can tell this cottage has been put together with love - it's simply beautiful inside and out. Cheryl and Alex are perfect hosts with their little girl kindly showing our daughter their ducks and rabbit. They are friendly and welcoming without being obtrusive and it really shows that they love welcoming guests to this stunning cottage. 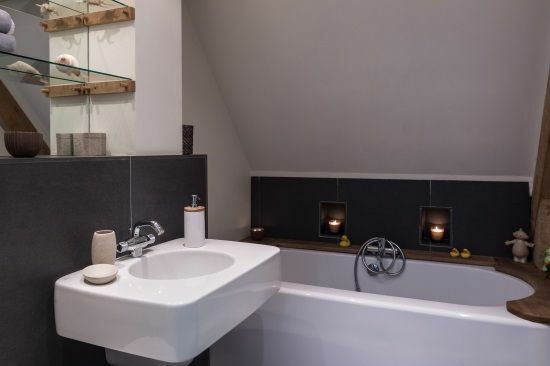 It's a bonus on top that the area is so stunning with masses to do for children and adults, but mostly we were bowled over by this beautiful cottage - thank you so much! 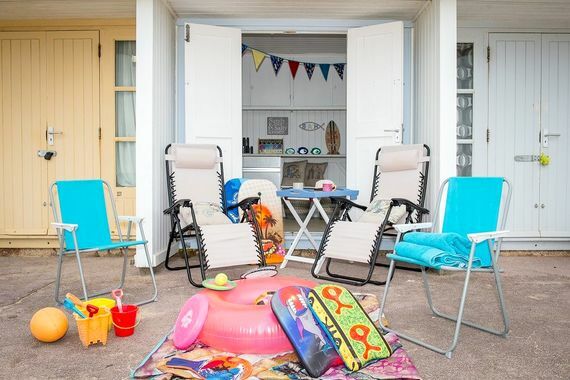 Perfect Base to explore the New Forest and coast with young children. Also convenient for Peppa Pig World. Everything we needed to entertain a 3 year old and 8 month old. They settled straight in and were delighted with the toys and garden. Dairy Cottage had everything we needed for our 1.5 and 4 year old boys, plus it felt luxurious for the grown ups too. The location was perfect for exploring the New Forest and the coast line - in particualr the lovely sandy beaches past Bournemouth. Cherly was very welcoming and provided lots of useful tips on outings for the boys. Dairy cottage is absolutely fantastic. 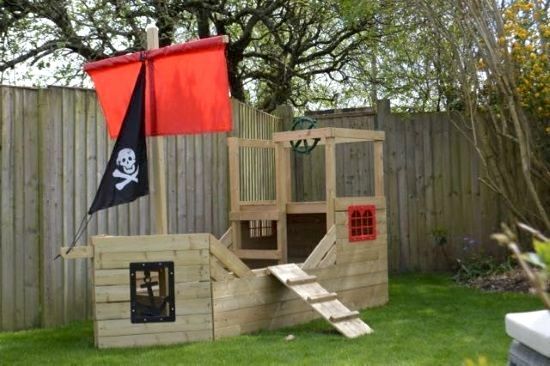 Not only is it beautifully decorated but it is fully kitted out - for adults and kids. So thoughtfully done that next time we will just stick us and the kids in the car and know that's all we have to bring. Surrounding area has so much to offer too. Just perfect. Was lovely and so beautifully designed - so easy that all the baby kit was there. Fab, friendly and flexible owners. Lovely accommodation with everything you could need for toddlers. Great location to access a range of activities in the new forest & around with everything not much more than a half hour drive. Would recommend for a nice relaxing break. Excellent. 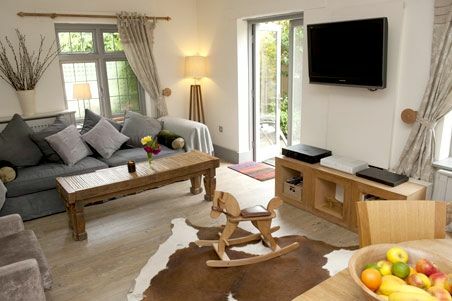 Very will equipped - every detail thought of - making for a very relaxing stay with a small baby. Amazing. Everything is thought of. We felt very looked after a home away from home. We had a fabulous stay at Dairy Cottage. 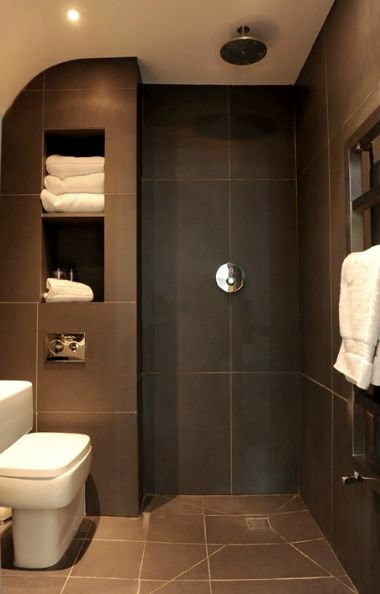 All of the extra touches make for a very relaxing stay. 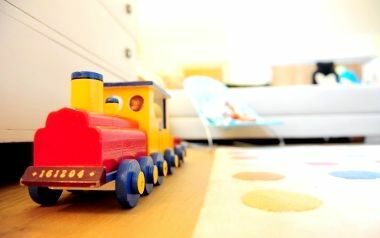 There are lots of things to keep children entertained, we didn't even use all of the toys during our stay! Everything is in good condition and the interior decor is wonderful. We really hope to return. Oh, and there is so much to do with kids in the area. I have already recommended the cottage to lots of friends! Lovely property, all the essentials were there and Cheryl was very helpful. Followed her advice on places to visit. Very impressed and would definitely stay again. We've visited Dairy Cottage twice now in the past 3 years & I can honestly say its the most beautiful, immaculate, toddler/ baby friendly/ equpped cottage that we've stayed in. Cheryl is so thoughtful and kind, and had put out so many toys and dolls for the children which just made the experience so special for them. The décor is beautiful and luxurious & was thoroughly enjoyed once the kids were in bed. Thanks for everything, we cant wait to stay again. Wonderful cottage, great hosts, perfect location. My 18 month year old boy had a brilliant time! Great house; it's our second holiday there because we just didn't want to be anywhere else! Beautiful location, lovely family who were helpful and kind, clean spacious rooms, lots of lovely toys... The only thing I had to take were clothes and a toilet trainer seat for my 2 year old son. EVERYTHING else was already there. So relaxing! We had a wonderful week at Dairy Cottage. It was perfect for a holiday with a toddler. I can't sing Cheryl & Alex's praises high enough - they are wonderful hosts and their cottage is simply fantastic. Beautifully decorated, obviously loved and brilliantly kitted out for a small family this cottage became home for myself, my wife and two baby boys almost immediately. By the end of the week we left wishing that we'd booked another. I can give no higher recommendation other than the fact that we will certainly be returning. I, for one, cannot wait. We stayed for 10 days during January and had a wonderful and very relaxing break. Cheryl and Alex made us feel very welcome and plied us with personal touches. The accommodation is stunning and has a really luxurious feel. Everything works well (wi-fi, fire, hot water etc) and our 2 year old was spoilt for choice with all the toys provided. The dairy cottage annex has absolutely everything that you need for a holiday with little ones. The interior is beautifully decorated with lots of little touches that make it special. Cheryl and Alex were both incredibly helpful and very welcoming hosts. A couple of things to consider though and we wish we had known in advance, the property is located on a relatively busy road that comes off another relatively busy road and you can hear the noise from that, especially in the kids room. The guest property is an annex so you can also here noise from next door - in no way is this excessive but it didn't give us the getting away from it all feeling we were hoping for. Ibsley itself isn't really a village and we didn't find any nice country walks immediately accessible from the house. It is a very short distance (drive) to a number of great activities and walks though. In short, we were hoping for a quiet new forest village where we could amble about striaght from the house but the location didn't really deliver for us. The property itself however is beautiful, well equipped with lovely hosts. OWNER RESPONDS: "Thanks so much for the lovely review. We are actually on a small country road with the nearest A road about 1/4 mile away. No one has ever mentioned road noise before but we'll bear it in mind. Ibsley is a village, which like so many in the UK has suffered from the rise of nearby supermarkets and the post office and general store closed, but we are just a few minutes walk to the cattle grid where the wild ponies are horses are and there are various walks by foot from the house. Some of the most scenic walks are worth the 3 minute drive from the house. We do list the cottage as an annexe with photos as showing our home but we are sorry if you missed that and if you heard any noise. There are two fire rated (better insulated) doors between us and most people who stay love the fact that we are close to hand to help and advice when required, almost in house concierge. Its where we chose to live so we may be biased but we think that the location is exceptional, rear views overlooking a nature reserve and Lake,wild ponies/cows (pigs 2 months in Autumn) just a 5 min walk away. With New Forest on your doorstep and The Jurrassic coast just up the road we feel it?s a hard one to beat! Thank you for your stay." A really wonderful house, with everything we needed for a short break with our 12 month old baby. Cheryl, the owner was very welcoming, and made sure our stay was comfortable and relaxing. 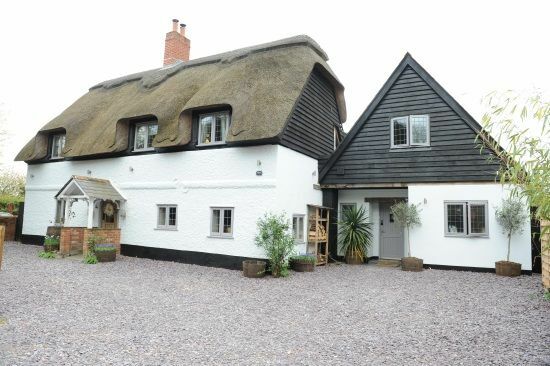 A lovely cottage in a superb location in the new forest. 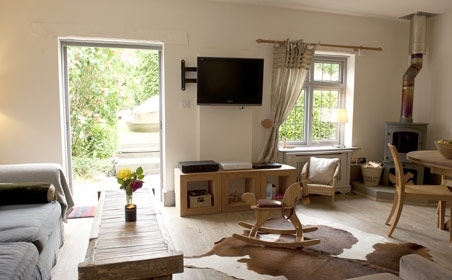 The cottage is very comfortable and very well equipped for both adults and little ones. The welcome pack is the best we have ever received!! Fantastic property. 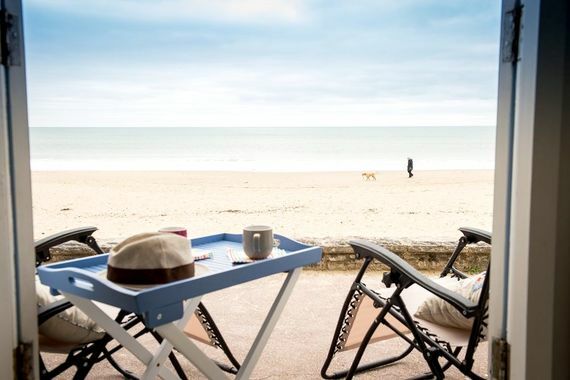 Very relaxing location, and ideally set up for our holiday with our 17 month old son. He loved it too! The cottage was clean, luxurious with homely furnishings that made for a truly relaxing stay! A fantastic house perfectly situated for walks into the forest and drives out to the beach. The children's toys and equipment were amazing, my 2 year old had everything he could possibly need and loved his 'oliday ouse'! We had a fantastic holiday. 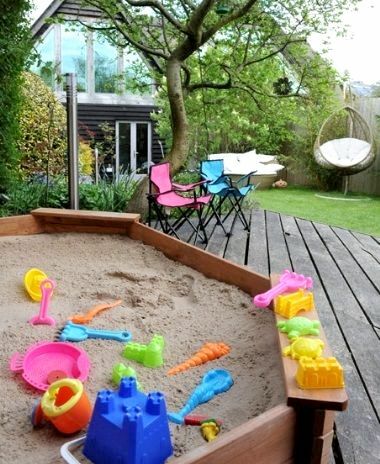 Very relaxing and great house for little ones. Lovely accommodation, really well appointed both for our 1 year old and us. Thoughtful touches like breakfast goodies made were a real treat and a lovely warm welcome. Well located for exploring the forest and the coast. Would highly recommend. Our 6 & 3 yr old girls loved this house and it's garden, they're desperate to go back!! We loved it too, the added extras were very much apprieciated, and we will be back one day! A lovely cottage in a nice location - fully fitted out with everything you could want or need for a family holiday. Very welcoming owners also! We really enjoyed our stay and wouldn't hestitate to stay here again in the future. We truly had a fantastic time at Dairy Cottage, we felt very spoilt throughout our stay and loved everything about the cottage especially the nursery, kitchen and views out of the bedroom accross the lake. Thank you for an excellant stay & for making us feel so welcome, I would definately recommend you to anyone else with children. We will definatelty be coming back, the cottage was a perfect base for exploiring the new forest. Thanks again. We had a fantastic stay here with our 8 month old boy. It's close to the forest for walks, and is well connected by road for going further into the forest or to the surrounding towns. The accomodation itself is fantastic, with a great range of baby toys and equipment. We'll remember to take less of our own stuff next time! And to cap it all off, Cheryl is extremely welcoming. In summary, an excellent place to both relax and have fun with children. Our second visit - love this cottage and the surrounding area. Highly recommended. We had a wonderful time, the property was really gorgeous and had everything we could possibily need. Beautiful cottage. Great thought has been put into all the kit for both parents and children from a great bottle of wine through to toys and books and the lack of delicate ornaments that make you nervous all the time! Our 2 and a half year old settled in quickly in "her room" and didn't want to go out. And looking after our 4 month old was easy given all the equipment that was available. The location is brilliant - 10 mins by car from Ringwood with a couple of supermarkets, 15 mins by car from Moors Valley, and just a short walk from ponies and the national park - and all with easy access from London. Our second visit - love this cottage and the surrounding area. Highly recommended. Overall Experience: Outstanding!! Outstanding Baby/Toddler friendliness, good interiors, in an excellent location with excellent customer care from the owner Cheryl. Overall experience: Excellent! We had the most amazing time at Dairy Cottage this weekend (despite the horrid weather!!). It's absolutely gorgeous, really, really luxurious, and we couldn't have wished for anything more. Overall Rating: 5Stars - Outstanding! My wife, daughter and I had the pleasure of being the first guests in this lovely cottage. The location is perfect, right on the edge of New Forest which meant that we were able to go for walks when we wanted. The cottage itself is really well designed, modern and comfortable, with all the amenities that a young family needs. Our daughter felt at home immediately. Babysitting meant we managed to get away for a couple of nice dinners. Cheryl and Alex are really friendly and gracious hosts - they welcomed us very warmly into their lovely home, made every effort to ensure that we were comfortable. We would love to go back again! We stayed at Dairy Cottage with our 6 year old son and 11 month old daughter. We were made to feel welcome from the moment we arrived. The facilities that were available for children were outstanding, all our and our children's needs were catered for. And Dairy Cottage is a wonderful place to relax and enjoy the New Forest, it's very central so great beaches, forest walks, tea shops and child friendly pubs are only 10 minutes away. Cheryl was a great tour guide and her hints and tips made our holiday even more enjoyable. We know where we will be going next year! Beautiful, well designed, chic yet child-friendly cottage in a great location with many local attractions to entertain the children. Wonderful hospitality with attention to detail. We will definitely return, perhaps even without the children! This could rival any boutique hotel I've ever stayed in and I have stayed in more than a few! we had a wonderful holiday - Cheryl was fantastic and made sure everything was perfectly set up for us and our twins! Description on the website exactly matched reality. It was great!